If you're planning on making a sliding jig or fixture for your woodworking shop, the INCRA Miter Slider is exactly what you need. These inexpensive aluminum runners adjust for PERFECT sliding action in any standard (or near standard) 3/4" by 3/8" miter gauge slot with just a twist of the wrist. They lock firmly in place with another twist of the wrist. Won't warp, shrink or swell like wooden runners. Includes plans for a wide variety of shop-made jigs and fixtures. Anodized aluminum for durability and beauty. Available in 18" and 24" lengths. The INCRA Miter Slider SE combines the versatility of the INCRA Build-It products with the unique performance and feel of the adjustable GlideLOCK miter bar used on INCRA miter gauges. Miter Slider SE is not recommended for stationary jigs that must be locked into position within a miter slot; choose standard aluminum Miter Slider for these applications. Steel bars are more rigid than wooden or plastic runners and are not susceptible to changes in humidity or temperature. 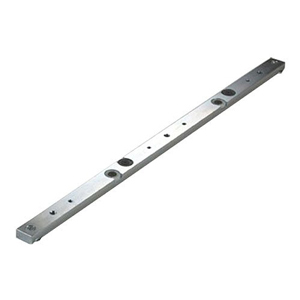 Miter Slider SE bars have (4) #10-24 holes that mate with INCRA Build-It Panels. 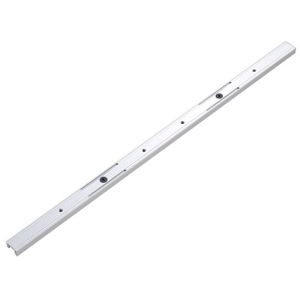 Miter Slider SE bars also have (3) 1/4"-20 holes along the length to accept knobs and other fasteners commonly used when building jigs and fixtures. Long-wearing Nylon GlideLOCK adjusting discs provide a precise fit in the miter slot of most table saws, router tables and band saws. Nylon GlideLOCK adjusting discs give the bars a smooth, low-friction travel. 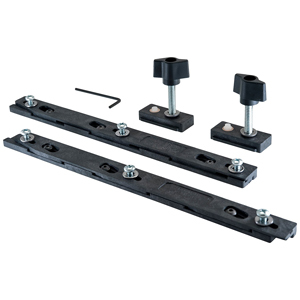 Bars include removable T-slot retaining clips for BOTH ends of the bar for superior stability of larger jigs. Miter Slider SE is compatible with all INCRA Build-It Panels. Miter Slider SE fits square-sided 3/4" x 3/8" miter slots with or without T-slot bottom. GlideLOCK adjustment for slots measuring 0.740" to 0.765" in actual width. Available in 2 sizes: 18" and 25.5"
The ZeroPlay Guide is a "One-Touch Calibration" miter bar(9-1/2" in length) that has two stacked half bars with opposing wedges's that expand parallel evenly to fit the exact width of a standard miter slot for a perfect fit and smooth glide, even fits the tricky Shopsmith™ or General's miter slots. Because the ZeroPlay Guide Bar is full profile miter bar that fits the exact width of the miter slot, you have no side to side play in the miter slot.The ZeroPlay Guide Bar is for those who demand absolute accuracy and have zero tolerance for mistakes. Build better jigs in less time! ZeroPlay Stops serve as an anchor for your clamping devices within the miter slot-shop build clamp plan is included. Build a table saw coving fence and more with the ZeroPlay. ZeroPlay Stops limit the travel distance for most any specialty Jig. Originally designed for the Dubby cut off sled, the Dubby Miter Bar can now be purchased separately for use on jigs and fixtures throughout your shop. 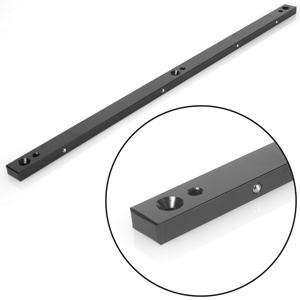 With unique steel plungers, combined with the precision machined steel bar, the Dubby 24" Miter Bar works great with most any sled fixture in your shop. The plungers can be adjusted so there is virtually no side to side play. 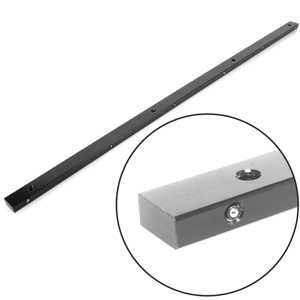 The bar comes with 4 machine screws for easy mounting to sled platforms. The bar measures 24" in length and fits standard 3/4 x 3/8" miter slots. 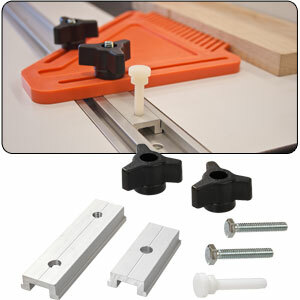 Finally a universal Precision Miter Bar for building virtually any sled or miter slot jig. With adjustable spring plungers, the miter bar maintains constant pressure against the walls of the miter slot so you have virtually no play side to side, while being able to slide through the slot with ease. The bar fits most standard 3/4” x 3/8” miter slots. Made of hardened steel the Precision Miter Bar will not bend or twist like some of the plastic bars you may have. This is the perfect accessory for anyone who likes to build their own jigs and fixtures and who is concerned with quality. 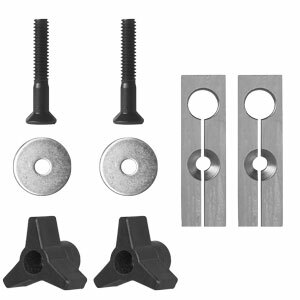 Use this miter slot locking kit to lock custom jigs and fixtures in any t-slot groove. We found it quite handy to lock all types of featherboards onto table saws, router tables and band saws. The t-bar will fit any 3/4" x 3/8" miter t-slot groove or our Standard MITER-T-TRACK. Make your own jigs & hold-downs. Excellent for attaching feather boards, hold-downs, and special jigs to your table saw, router table, disc sander, or any other tool with a standard 3/4" wide x 3/8" deep miter gauge slot. The bars pull up tight in the slot as you tighten the knobs. These square-slot Bars fit both square and t-shaped miter gauge slots. Square-Slot Bars are 2-1/2" long and expand in the slot as you tighten the knobs. Each kit includes 2 each: jig bars, knobs with screws, and washers. The perfect accessory kit for attaching featherboard, hold-downs or virtually any type of jig you can think of to your table saw, router table, or any tool with a standard 3/4" x 3/8" miter gauge slot. The fixture kit works by applying outward pressure to the "walls" of the miter gauge slot. The "wedge" bolts push up into center counter sunk holes in the miter bar as they tighten with the star knobs, which pushes the center of the miter bar outward producing a nice tight fit.